I wanted to like the DriveEye Ultra Portable HD Vehicle Recorder ($179.99) from Swann. After watching so many dash cam videos from Russia and elsewhere, I thought it would be nice to have one for my car, in case a meteor lands in front of me during my commute. There were some nice features and it might be worthwhile under the right conditions, but it's not for me. I recently wrote about a dashcam offering that wasn't too impressive. It cost $180 and my impression was you would be better off using an iPod touch or older iPhone as a makeshift dashcam. Then I got to try the iPro2 Car Mount ($49.95) from iBOLT and it cemented my thinking. Apple just boosted the iMac line so all devices support 4K or 5K resolution, and to coincide with that, it released a free update to iMovie for Mac OS X that lets users edit video at 4K resolution. The iOS version was already enhanced last month to match the new iPhone 6s and iPhone 6s Plus. For a short time, videographers could create and edit higher resolution videos on their iPhones than on their $2,000+ iMac computers! If you're intrigued by the new Live Photos feature of iOS 9 and the new iPhone 6s, but are disappointed that it only works on certain devices, there is an easier way to animate photos to share with others. Animated GIFs have been around forever, but I recently downloaded an app, GIFO - Best GIF Camera (free) from Americos Technologies, that makes creating custom GIFs a breeze. I'm a big fan of Augmented Reality and also a big proponent of education, so I was glad to see them combined with AR Magic Cards. This is a combination of a free app (AR Magic Cards) and physical cards (or a printout) which can be used to display augmented content when scanned. The project is primarily for Chinese audiences, but there is an Indiegogo campaign to bring it to more audiences. 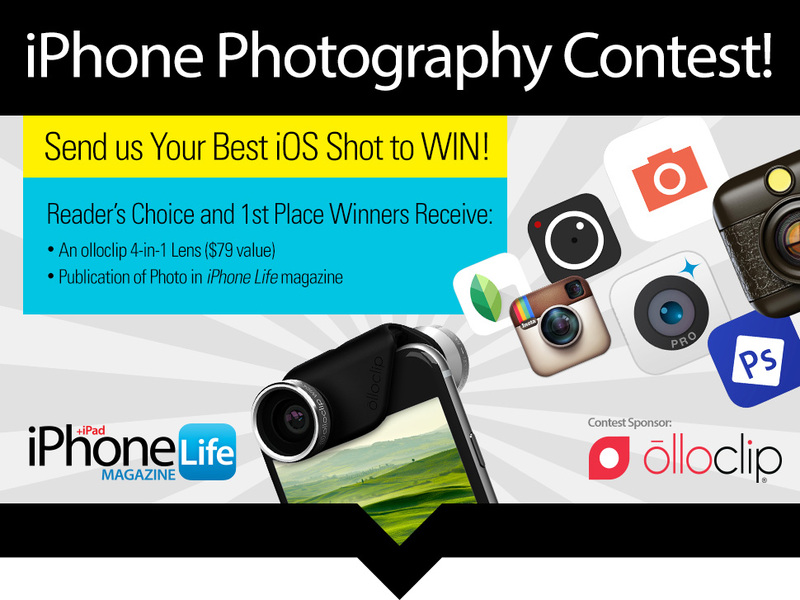 Enter the iPhone Life Photo Contest: Deadline October 30! Read more about Enter the iPhone Life Photo Contest: Deadline October 30! As if the Selfie Stick epidemic wasn't enough, leading to bans at Disney World and in museums, now the makers of Cinnamon Toast Crunch want you to take selfies during breakfast, with their Selfie Stick Spoon. I guess it's the next logical evolution, after Instagramming our food and taking selfies. Now, you can combine the two. It's hardly a practical gadget; but it does work as a marketing tool, getting people to talk about Cinnamon Toast Crunch, something I never expected to do at iPhoneLife.com. Last Chance to Vote in the iPhone Life Photo Contest: Voting Ends September 10! Read more about Last Chance to Vote in the iPhone Life Photo Contest: Voting Ends September 10! Enter the iPhone Life Photo Contest: Deadline September 4! Read more about Enter the iPhone Life Photo Contest: Deadline September 4! Apple has made a big deal about how great the iPhone 6 and 6 Plus cameras are. The company has put up billboards and posters and has been running commercials highlighting customer photos and videos, all with the tagline "Shot on iPhone 6." Unfortunately, some users of the iPhone 6 Plus haven't had as good a camera as Apple is touting. During a specific time period, an inferior part was used and the result is blurry photos from the rear iSight camera on some iPhone 6 Plus models. There are a variety of reasons why you might want to transfer your photos from your iPhone to your computer. Maybe you’re running low on storage space and need to clear out some room in your Photos app; or maybe you just like the extra bit of security that comes with having your photos on multiple devices. Here’s how to use AirDrop to transfer photos between devices. Panoramic photos are great for capturing an expanded view of a beautiful landscape. Typically, this is done by moving your iPhone from left to right or right to left as you take the photo in Pano mode. But what about when you want to capture a shot of something really tall, like a tree, for example, or even the Eiffel Tower? Well, you'll be excited to hear that you can take vertically oriented panoramic photos with your iPhone too! After two years without any enhancements, Apple finally updated the iPod touch line. But aside from the new colors, you might not notice the difference. The new iPods are available in a new set of colors, officially dubbed space gray, blue, gold, pink, and silver. There's also a (PROJECT) RED version to fight Aids in Africa. These colors are darker than the previous generation of pastel colors. Apple also migrated the iPod shuffle and iPod nano to the new color scheme. With the new iPod touch, the camera may be the most significant upgrade. Looking for a Better Portable Flash? IBLAZR 2 Is Coming! The IBLAZR ($39.99), previously featured in our CES coverage, has gone on to rave reviews and something like a billion units sold (OK, I don't really know how many, but a lot.) So get ready for the next portable camera light you didn't know you needed: the IBLAZR 2 (crowd roaring and fireworks)!! It hasn't yet been officially announced, but a new Kickstarter effort is coming that ups the flashlight camera ante yet again; the second generation includes Bluetooth remote control, and an even more sophisticated app for taking great pictures in any lighting condition (well, maybe not at the bottom of the ocean, for that we might have to wait for the iBLAZR 3.) Read on for more information on this upcoming add-on flash unit. Read more about Looking for a Better Portable Flash? IBLAZR 2 Is Coming! Tangerine is not only a lovely citrus fruit, but also the title of a Sundance Film Festival official selection. Tangerine is the first full-length feature film to be shot entirely on a mobile device. If you want to give shooting high quality film with your iPhone a try, the Steadicam Smoothee ($169.00) could turn your home movies into professional looking Steadicam work, and offer professional videographers an entry path into the Steadicam experience. Enter the iPhone Life Photo Contest: Deadline July 6! Read more about Enter the iPhone Life Photo Contest: Deadline July 6! 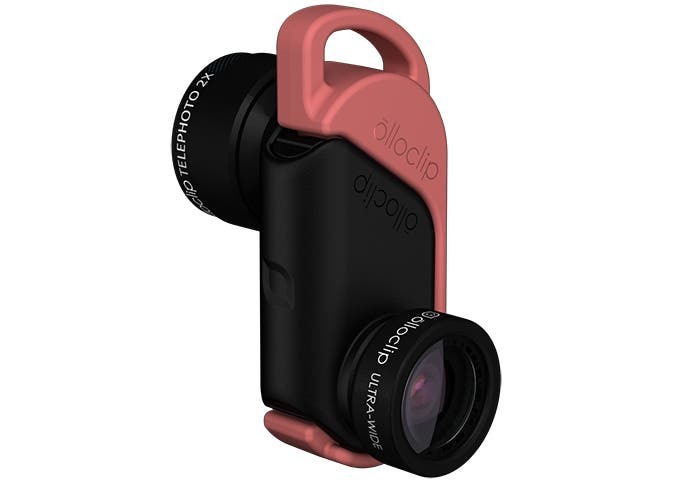 Olloclip has added yet another camera accessory to its lineup. The new Active Lens for the iPhone 6 and 6 Plus is available for preorder on its website.